Grilling corn on the cob is a great treat at summer barbeques but might take up too much time and precious grill space, especially if you are hosting a large crowd. Here’s an easy way to deliver a tasty side dish of corn that your guests will surely appreciate. In a deep skillet fry the bacon. Remove from skillet, crumble it and set aside. Save some of the bacon grease, and add the pepper and onion to the skillet. Cook until soft and then add the corn. If you prefer to sweeten the pot, add some sugar to the corn along with a little salt and pepper to season it. If you like things hot, use a little cayenne pepper. 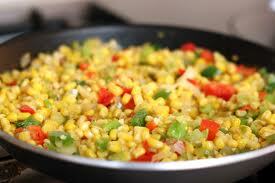 When the corn is thoroughly heated through, return the crumbled bacon to the skillet, stir and serve.